Seriously. Who thought it would be a good idea to boil Brussels sprouts? If you think you dislike Brussels sprouts but boiled Brussels sprouts are what you really mean, please give them another try. Let them live up to their delicious potential! Asparagus is at it’s lowest price of the entire year right now, at least where I live. I bought a few bundles and used some to make a pot of this amazing soup. If you’d like to stock up (this soup really is that good), simply follow the directions below and stop at Step 3. You can freeze the partially prepared soup well into autumn, then thaw and continue with the last few steps. So easy! Here in the US, there is a lot of madness right now. Working in my garden provides me with much needed respite. There is something calming about working slowly in the sunshine, blocking out media as I focus on pulling weeds, listening to bees, and tending to my vegetable plants. 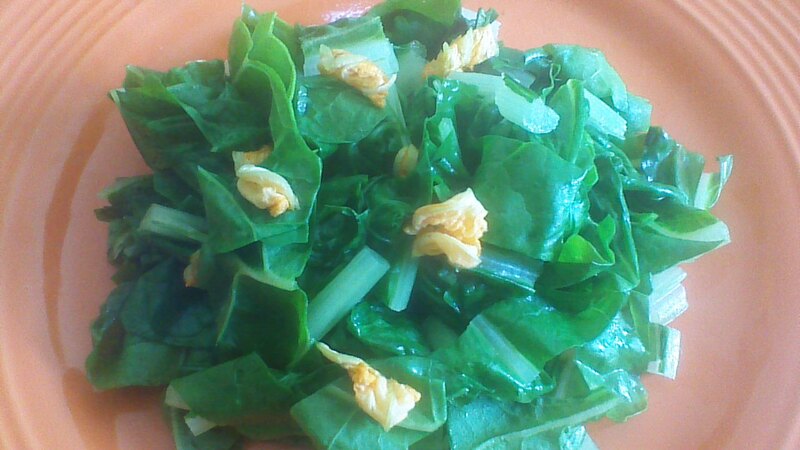 Here’s the super simple dish I prepared – a bit of sunshine on a plate. We could use a little more sunshine these days. Step 1) Slice Swiss chard stems into 1/2 inch pieces and sauté in butter for 1 minute. Step 2) Slice Swiss chard leaves into 1 inch strips and add to the pan. Sauté for an additional minute. Step 3) Slice the top half of each squash blossom (the orange part) into thin strips and add to the pan. Sauté for one, final minute. Transfer to a serving plate and sprinkle with sea salt and pepper. I love cooking with eggplant – it’s very low in calories and versatile – but I don’t always think of eggplant when I’m looking for something fast. Lazy Cheesy Eggplant requires only a few minutes to prepare, and a half hour in the oven… the results are addictively delicious! 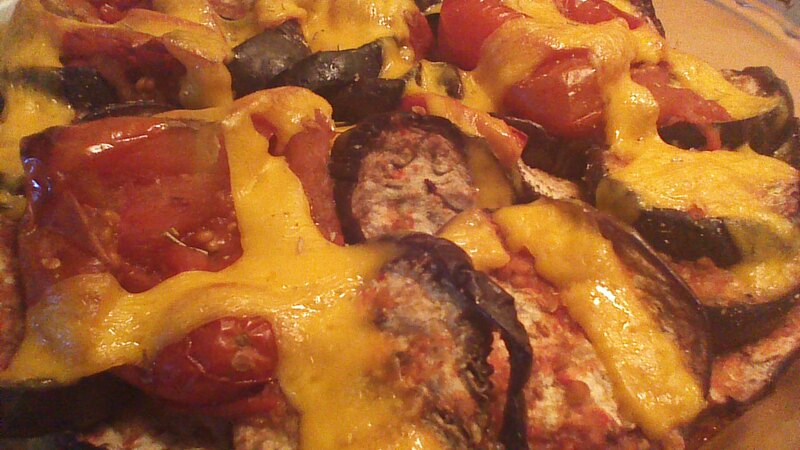 Each high fiber serving of Lazy Cheesy Eggplant contains approximately 125 calories.